Pasture lands currently support beef, goat and sheep farmers as well as dairies. Much of the livestock is sold on the commodity market but that is changing due to the presence of abattoirs and butchers in McBride and Prince George. Many producers raise chickens and sell eggs into the local market. Robson Valley honey is produced and sold in Dunster. There is an abundance of arable land in the Robson Valley, and the fertile soil is ideal for short season crops such root vegetables, cabbage, kale, and garlic. Some local growers have established "box programs" to provide a regular supply of local vegetables to those living in the region. If you are considering an agricultural venture in the Robson Valley existing producers are always glad to share their knowledge to help you along. 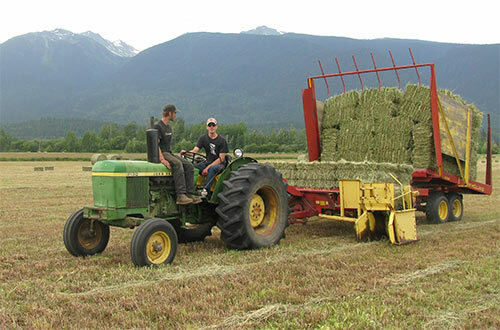 A producers group called the Three Valleys Community Development Cooperative was formed in the Robson Valley in 2002. This group is actively engaged in promoting local produce, sharing knowledge and machinery, and developing more markets for locally produced products. One of the oldest Farmers Institutes in the province is still active in McBride, and the Robson Valley Cattlemen’s Association is another agriculturally related group important to the Valley. There is also the relatively new Robson Valley Growers Co-op and the Beyond the Market initiative from the Community Futures Development Corporation.